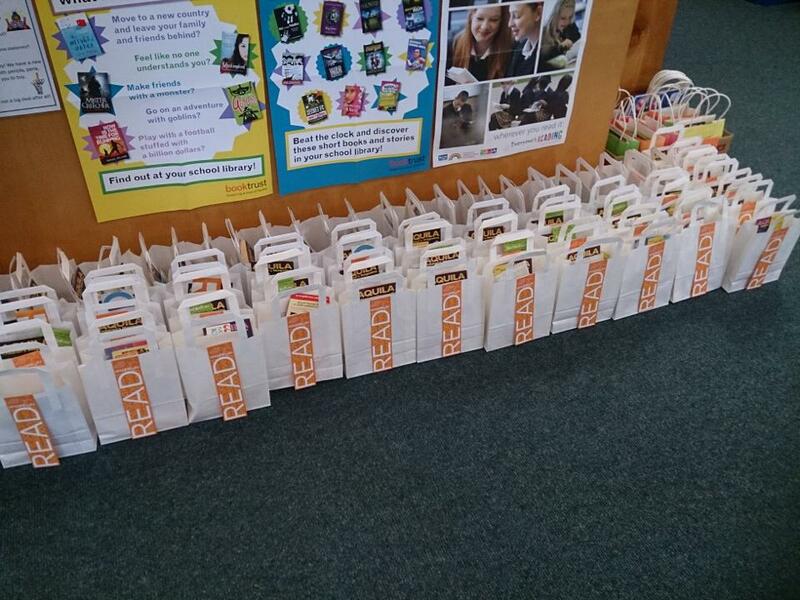 Valerie Dewhurst, Head of Library at QEGS Blackburn, spends her year collecting little freebies and other items to make into these wonderful goody bags. She presents these to pupils on the primary liaison day. Inside the bags (which she buys very cheaply wholesale from this website) this year are: bookmarks, stationery, Aquila leaflet, WBD book (which you can buy cheaply by the 50’s), a wordsearch, a summer reading list – and anything else she sees which may be useful. 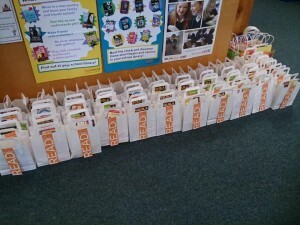 What a great way to promote reading and libraries! This would also be a wonderful way to welcome new Year 7’s, with an information leaflet about the library, a Dewey bookmark, reading diary – a bag to carry their first loan home in. I am getting excited by the possibilities already – thanks for the inspiration Valerie! 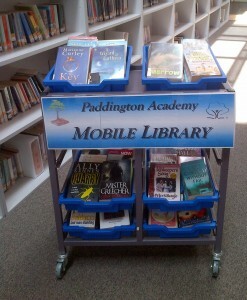 Does your school have a mobile branch? Paddington Academy does! Barry Chaplin, the librarian there told me that he: ‘borrowed a laptop and trolley (with 6 small trays and two big ones) from the Science Department, loaded the laptop with Eclipse2 and created a mobile library, stocking it with around 120 books from the boxes, the date stamp and its own banner. I had the good luck to have inherited an old silver security brick so was able to de-secure the books easily. One of the big trays was kept empty for returns which were booked back in securely at my desktop. The Mobile Library was taken to the breakfast club every morning and to tutors and English teachers who booked it for library sessions. 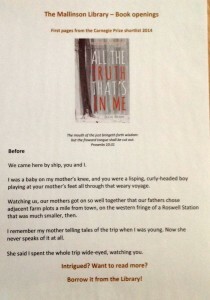 Advertising books – in the toilets! 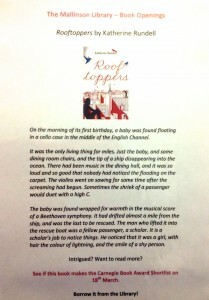 Lucy Atherton from the Mallinson Library at Wellington College contacted me with a novel way of advertising books. She had taken notice of the adverts you see on the back of toilet doors in public conveniences, and had decided to experiment with advertising her books in the same manner. 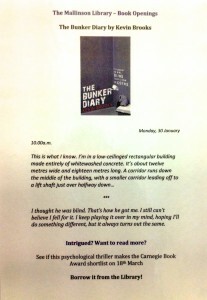 She started with three of the Carnegie shortlist – All the Truth that is in me, The Bunker Diaries and Rooftoppers. The sheets were laminated (of course!) and put up in both male and female toilets. 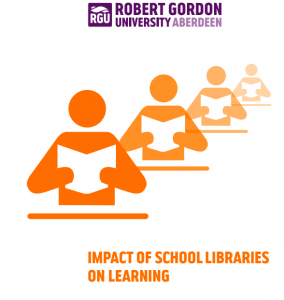 It has brought pupils in to the library asking for books they wouldn’t necessarily have borrowed, and Lucy is preparing her next set of advertisements now. Read more about it on her blog here. The photos are below, but due to the lamination and the nature of the lighting, they are not as clear as they could be – but what an amazing idea, don’t you think?